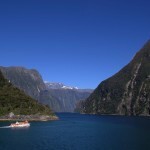 This picture was taken on a recent trip to New Zealand cruising through Milford Sound. The sound runs 15 kilometres inland from the Tasman Sea at Dale Point the mouth of the fiord – and is surrounded by sheer rock faces that rise 1,200 metres or more on either side. Peaks are covered in snow which is pretty impressive for November (approaching summer in Southern Hemisphere) Also another place I liked was Napier, which was rebuilt in the early 1930s following a massive Richter 7.8 Earthquake. Subsequent fires destroyed most of its commercial heart. By the end of the decade, Napier was the newest city on the globe and the best collection of art deco buildings still around. Really impressive, like the cruise ship that took us there.